21/5/12 - Acquisitions - San Marino, The Huntington Library - Henry Edwards Huntington (1850-1927) was a railroad magnate and inveterate collector mostly of books, but also paintings, whose collection was opened to the public in 1927. The Huntington Library, in California, today holds a beautiful ensemble of 18th and 19th century English and French paintings, notably portraits, including the very beautiful Blue Boy by Gainsborough, as well as a fine selection of American art and, since 1999, the Sanford and Helen Berger collection of William Morris works. 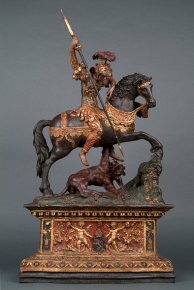 Two very different pieces have recently joined the museum with the support of patrons (the Art Collectors Council) : a 16th century Italian statuette, Saint George and the Dragon (ill. 1), rounds out the modest holdings in Renaissance sculptures at the Huntington. In polychrome and gilt wood, it was purchased from a Parisian gallery. Catherine Hess, curator of the European department, along with Giancarlo Gentilini, suggests an attribution to the Lombard artist, Giovan Angelo del Maino, perhaps born in Milan around 1470 and active in Pavia between 1496 and 1536. The artist shows a certain inventive talent here, managing to represent a rearing horse in the wood thanks to the addition of a hillock under the hoof and the dragon paw which is wounding and supporting the animal at the same time. There are several known works by this sculptor, such as the surprising altar intended for the church of San Agostino in Piacenza which today resides at the Victoria and Albert Museum, the Marriage of the Virgin at the Museo Poldi Pezzoli in Milan and also the Massacre of the Innocents at the Boston Museum ; all reflect his taste for a brilliant and varied polychromatic treatment, as well as several figures comparable to Saint George, whose uniform - colored pants, plume, wave patterned skirt valence, flapping epaulettes - is characteristic of the artist. Thus in the Marriage of the Virgin, to Joseph’s right, we find a figure in a rich and complex costume which looks quite similar. The Massacre of the Innocents shows a soldier standing much like Saint Georges, in profile, with his right arm brandishing a sword. Art Collections, and Botanical Gardens. The painting Shadow and Light by Constant Troyon (ill. 2), presented at auction on 25 May 2011 at Doyle New York, sold for $40,625 (including charges), that is double the estimate. 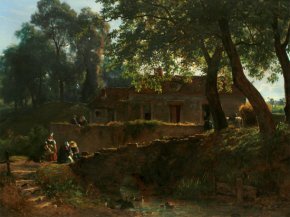 It joins the works by Daubigny and by Charles-Emile Jacques already at the Huntington, as well as others by Constable, which French artists discovered at the Salon of 1824 and whose influence is easily detected here. A date for this work remains uncertain : "1830-1840", in any case means that it was painted before Troyon met Rousseau and Dupré in 1843 and long before his painting turned to representing herds, after seeing Potter during a stay in Holland in 1847. This work is particularly attractive due to the backlighting and the zigzag effect of the staircase animating the shadows highlighted by a luminous stroke, which leads the viewer’s eye to the background where the artist has set down a sunny landscape.